Please note, many Regal issues also carry an EMI logo. This is not a label and EMI should not be added as a label, it instead indicates that Regal was part of the EMI Group. Following the merger the Regal label was predominantly used by Compañia Del Gramofono-Odeon, S.A.E. from the 1940s , as the Columbia Graphophone Co. Ltd. did not hold the rights to use its Columbia imprint in Spain, which was subsequently owned by an unrelated company Discos Columbia, S.A.. 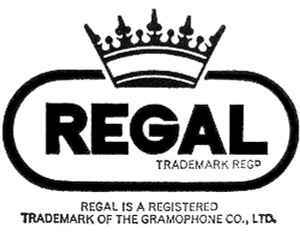 In 1965 Columbia Graphophone Co. Ltd. is merged into The Gramophone Co. Ltd., who becomes the registered owner of the Regal label (trademark.) and CGCL back catalogues, subsequently bringing the Regal & Zonophone (Regal Zonophone) labels (trademarks) under one common ownership. Post 1965 The Gramophone Co. Ltd. introduces the "Regal crown" imprint (separately registered trademark), used mostly as an outlet in the UK for reissues, compilations, including some new material. The rights and ownership to the Regal imprints were subsequently reassigned to EMI Records Ltd. in 1973, with the label being revived several times over the years. On the 27th April 2004 ownership of the imprint passes to EMI Group Plc subsidiary EMI (IP) Ltd. (intellectual property holding company) with EMI Records Ltd. subsequently becoming a licensee, this licence was cancelled on the 5th June 2013, however ownership and rights to the label were acquired by Warner Music Group, Inc. subsidiary Parlophone Records Ltd. on the 27th march 2013 following the formation of the Parlophone Label Group (PLG Holdco Ltd) which was created through the divestment of the EMI Group Plc. An affilated company dealing with copyrights etc, is Regal Recordings.